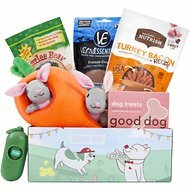 Bound to become one of your best friend’s favorites, Outward Hound's lovable toys are durably designed with an engaging array of shapes, sounds and textures so you can have huge fun with your furry friend. 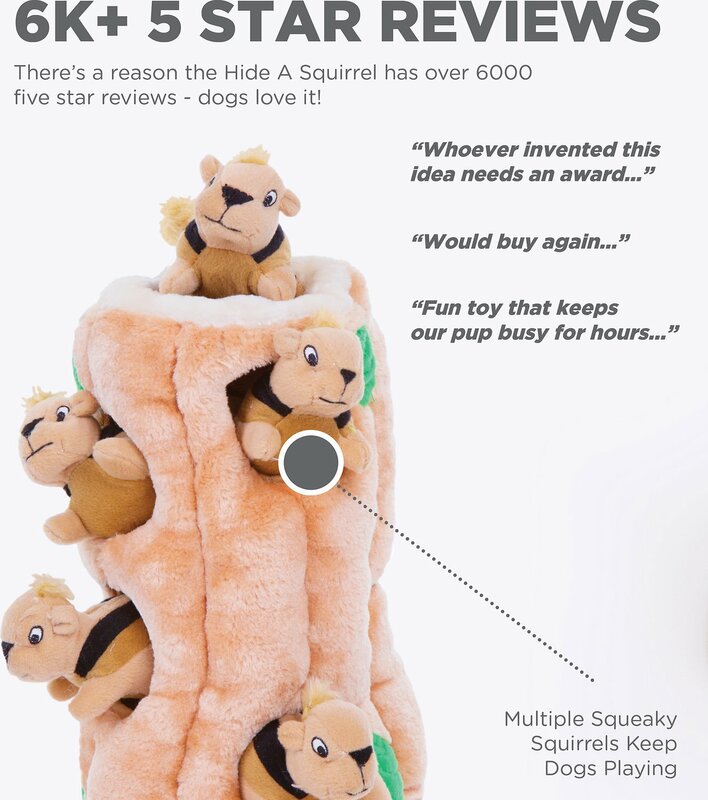 Treat your pup to hide-and-seek fun with Hide A Squirrel! 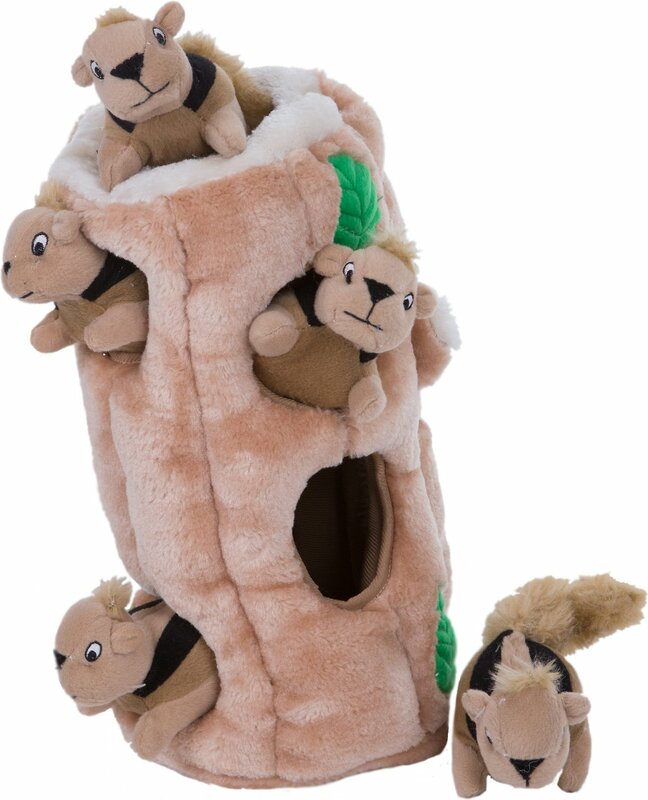 Just stuff the squeaky squirrels in the plush tree trunk, and watch as your dog sniffs them out. To keep the game going, just stuff them in again and again! 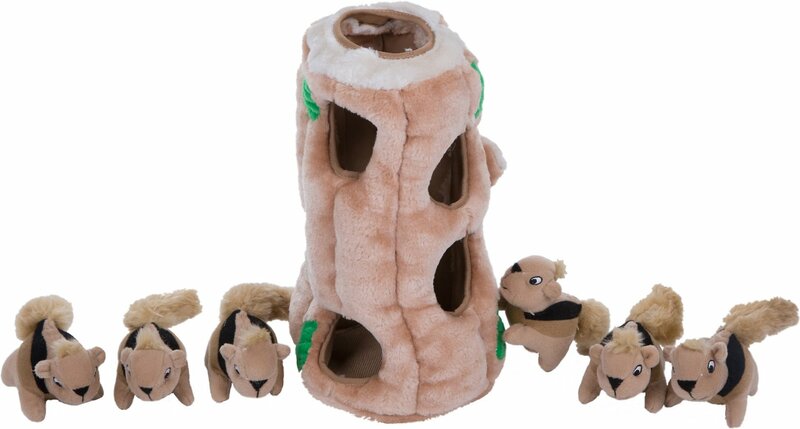 Squeaky squirrels and durable plush tree trunk. Durably designed with an engaging array of shapes, sounds and textures. Junior, Large & Jumbo include 3 squirrels. Ensure playtime never stops with Replacement Squirrels. Just stuff the squeaky squirrels in the soft tree trunk, and watch your dog pull them out one by one. My baby loves this toy!! I bought her a small one of the hide a squirrel and she went crazy for it! When my husband pulled this one out of the box she immedietly knew what it was and tried to take it from him before he could remove the packaging. She is a pretty light chewer so these will last her a while. Other really tough chewers will probably have the little squirels apart in no time. However, they will have a blast doing it! I purchased this toy for my dog's "gotcha" birthday. For those in my generation who understand the reference, he already has a moose chew toy and I thought it would be cute to have "moose and squirrel." Wrong choice. He tore the bottom cardboard out and started ripping out the soft covering. Didn't last but ten minutes. The squirrels are surviving because they are too small for him to get a good grip with his paws to rip them up. He is a 70 lb. mix. If your dog is a "ripper" or a "shredder", I would not recommend this toy. It is very soft and very cute, though. 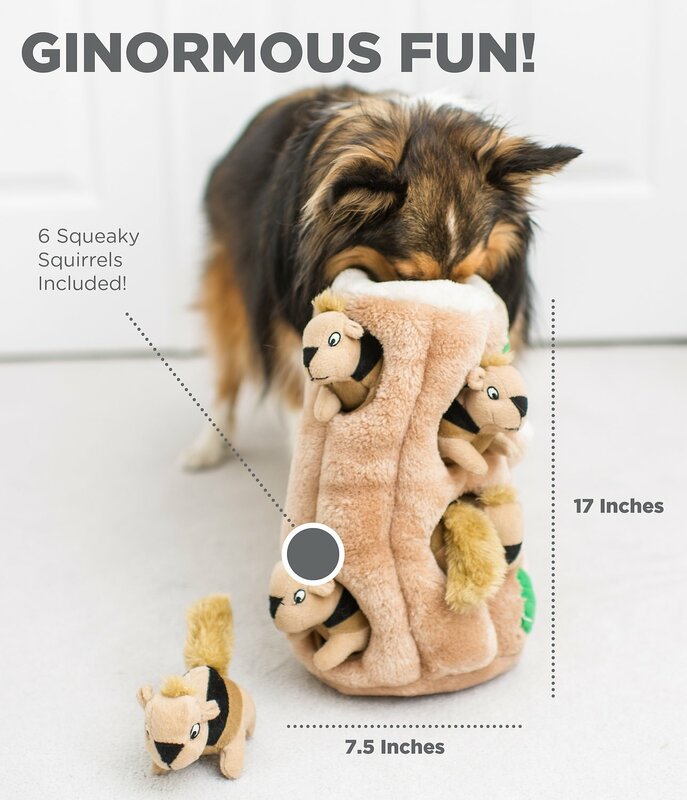 We knew this toy would not last a really long time in our household, with two huge dogs and a small one, but the price was good and we were curious! It has lasted over a week now, which is longer than I would have expected. The dogs have had a blast with it. The log is chewed up, some of the squirrels have lost their stuffing and squeakers, but there are still a couple of squirrels intact, amazingly! (Even dog toys that are "chew-proof" often don't last more than a day in our house, to give you an idea.) Totally depends on your pet as to how long it will last... but really FUN toy! My boyfriend's pit bull absolutely loves this toy! She can't get enough of it. Normally stuffed toys only last 2 days with her, she's a super chewer. But all of the squirrels are holding up really well. She is purposely chewing the tree trunk apart, but even still, it's held together for 2 weeks now. I will definitely be getting her another one once she's managed to tear this one apart. LOVED IT but made very poorly..
My golden retriever puppy LOVES this toy! Except... he destroyed one of the squirrels within a half hour. He’s never destroyed a toy before, so he’s not a super chewer or anything. The squirrel he destroyed, even I could pull apart the stitches of the squirrel without pulling hard at all. Just not well made - a huge disappointment because he definitely LOVES the burrow aspect of this toy!!! We’ll see how long the other two squirrels last..
My 7 year old Lab received one of these as a gift when he was recovering from double TPLO surgeries. He loves it, especially if I hide treats inside. Recently adopted a Lab puppy, who also fell in love with the squirrels, creating a problem. 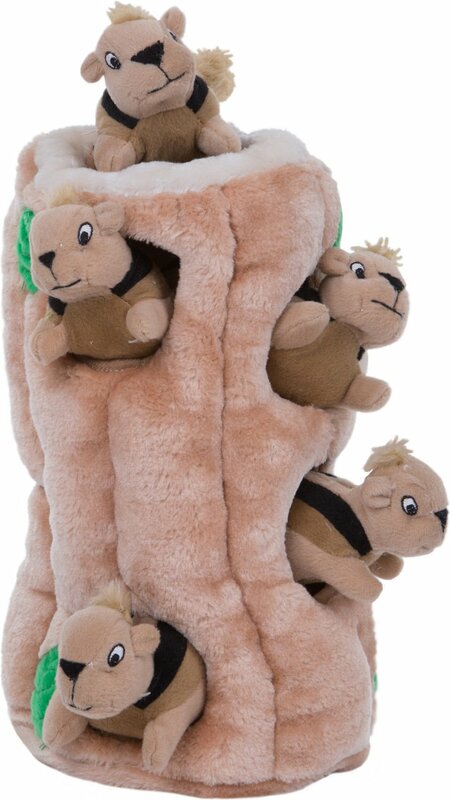 I ordered one for the puppy and hide treats in them for both dogs to have as I leave for work. They wait impatiently to get their squirrel toys! Definitely a winner and well made. Each squirrel has a squeaker, which adds to the fun. This toy is very fun for him, he absolutely loves the squirrels in there. Sometimes, I gather other toys and shove them into the log and he loves trying to get them out of the log. The bottom portion of it seems to be made of some kind of cardboard, which also keeps him engaged. He hasn't ruined any part of the toy minus, pulling some hair off of the squirrel's tail. I wasn’t sure if this toy would keep my border collies attention and what do ya know, she will occupy herself for nearly an hour at a time. She loves the squirrels and seems to know they are not extremely durable and plays very gentle with them. She also likes to use the log as a pillow. I recommended the toy to my colleague who has a pit/mutt mix and it was a big hit with him as well. It would be nice if there was some kind internal compartments or netting, something to add just a little more challenge!